Last month we featured a blog that discussed fluoride and water fluoridation, uncovering a little more than healthy teeth. Haven’t most of us heard for years to brush at least twice a day with fluoride toothpaste, and that fluoride in drinking water helps prevent tooth decay? The Washington Post published an article June 16, 1997, which is still relevant today. “As 8-year old Mollly Statt stood in the bathroom brushing her teeth, something on the back of the large-size tube of Crest caught her attention. She stopped brushing. For the past 70 years fluoride has been added to public water supplies to bring it to a level that has been determined to prevent tooth decay. Almost 75% of the U.S. population is part of a fluoridated community water system. Water fluoridation means adding industrial-grade fluoride chemicals to water to prevent tooth decay. 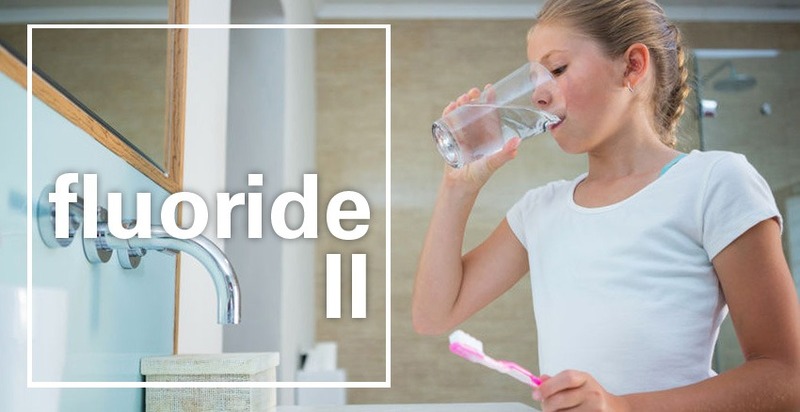 The fluoride chemicals used to fluoridate drinking water are: Fluorosilicic Acid, Sodium Fluorosilicate, and Sodium Fluoride, which are unpurified industrial by-products that are collected in the air pollution control systems of certain industries, such as the phosphate fertilizer industry. As a child makes the passage through the first 8 years there is a marked risk of dental fluorosis, which is a defect of tooth enamel caused by taking in too much fluoride. It can result in stained teeth disfiguring the smile to possible erosion and even crumbling of teeth. Before the widespread use of fluoride in dentistry, dental fluorosis was rare in western countries. Today, with just about every toothpaste containing fluoride, and most U.S. water supplies being fluoridated, dental fluorosis has gravitated to unprecedented levels. According to the latest national survey by the Centers for Disease Control, 41% of American adolescents have some form of fluorosis—an increase of over 400% from the rates found 60 years ago. Fluoride is a developmental neurotoxin along with arsenic, lead, and mercury. Dr. Kathleen Thiessen is one of the top scientific experts on fluoride. She served as one of twelve committee members for the National Research Council Scientific Review of Fluoride in 2006 where it was determined that the evidence does not support the benefit of water fluoridation, but it does support the likelihood of a number of adverse health effects. What does this mean, exactly? In September 2017 a U.S. government funded study was published in the U.S. Government’s Environmental Health Perspectives. This landmark study found children exposed to fluoride in utero have significantly lowered IQ ratios. Fluoride crosses the placenta; hence, a mother drinking fluoridated water is passing it to her unborn child. Keep in mind infant formula mixed with fluoridated water is a direct passage to the infant as well. Fluoride also crosses the blood brain barrier, allowing it to enter the nervous system. There are currently 59 human studies that have looked at fluoride exposure and its effects on brain function. 52 of these show fluoride’s damaging effects: lowered IQ, behavioral deficits, nervous disorders, and memory disruption. In March 2014 fluoride was classified as a neurotoxin in the world-renowned medical journal, The Lancet. Click here to read more. Infants and children are not the only ones affected by fluoride ingestion. Adults are affected as well. The following is a list of potential disorders: arthritis, bone fracture, brain effects, cancer, cardiovascular disease, diabetes, endocrine disruption, gastrointestinal effects, hypersensitivity, kidney disease, male fertility, pineal gland, skeletal fluorosis, thyroid disease, and acute toxicity. To learn more about these disorders visit the following link. Our goal at Gordon Brothers Water is to raise awareness as to what’s out there or better said, what’s in there in relation to water that could affect your health and the health of those you love. Water Quality Awareness Events are interventions we offer at multiple Home Depot locations in Northeastern Ohio and Western Pennsylvania. We always offer free water analysis plus estimates on water treatment for your home or business. We are simply a phone call away! Have additional questions? Is there a topic you’d like to see in our next blog? Contact us here.